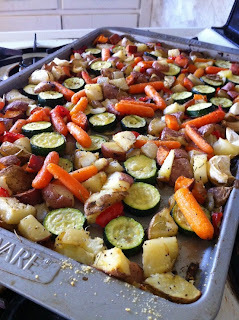 I could eat the whole pan of these veggies for dinner. Seriously, I would be completely satisfied with just this! 2. Wash/peel/chop veggies. Toss them in a little olive oil and sprinkle with salt, pepper & garlic powder (I used Johnny's Garlic). 3. Bake for 40 minutes. Sprinkle some grated parmesan cheese and bake for an additional 5 minutes.